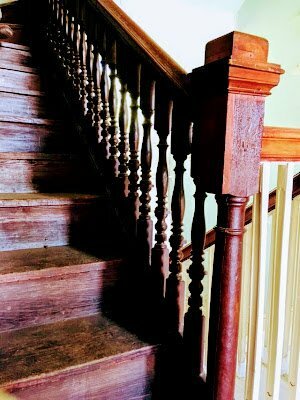 Where in Prince George’s County might you find the Bostwick House, an elegant two and one-half story Georgian structure completed in 1746 whose terraced lawns are linked with white marble steps that once graced the U.S. Capitol (and whose front porch was recently treated to great restoration work thanks to the fine folks at HistoriCorps)? 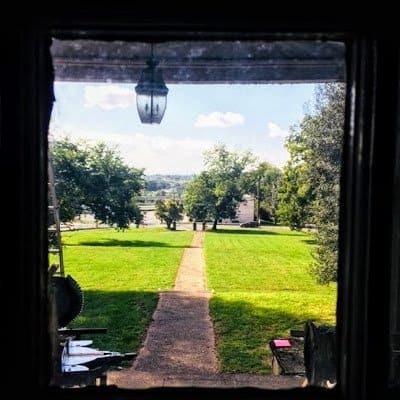 Here’s a hint: This historic house has ties to the town’s mercantile roots, the War of 1812 and sits across from the Anacostia River. What’s that? 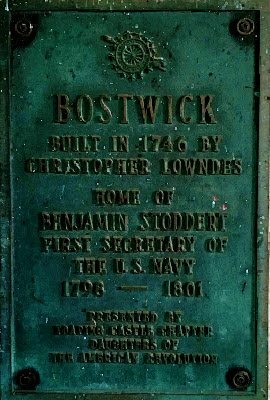 You think the Bostwick House is located in the Town of Bladensburg, Maryland? 🔔🔔🔔 You are correct! This beautiful historic house is indeed located in Bladensburg and was actually purchased by the town in 1997 for “public purposes the preserve this unusual and precious piece of Bladensburg history,” according to a brochure issued by the Friends of Bostwick, Inc.
of the resplendent Anacostia River Valley (minus chainsaw-ish device to the left). 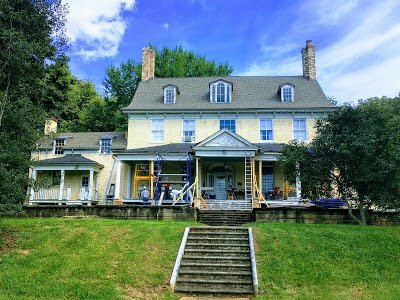 The Bostwick House is currently used by the University of Maryland’s Graduate Program in Historic Preservation as a study site, on which they both study and restore the House. 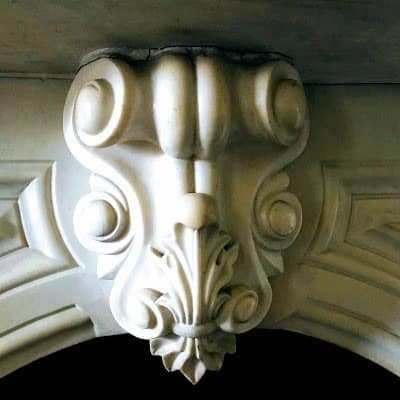 For a deeper dive into the details on this historic house and the folks who lived and worked there, head to this site about the Bostwick House. 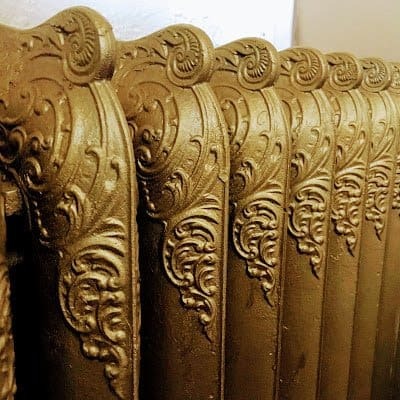 Preservation Program) shares details on the details! 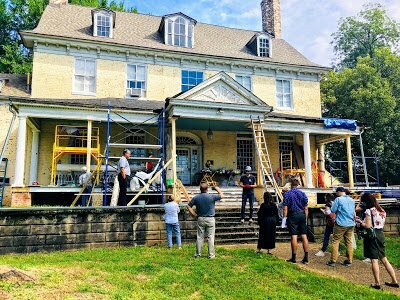 🔊 While the house is not currently open to the public, the Town of Bladensburg and those involved in the preservation of the Bostwick House would love to hear ideas from Route One Fun readers on future uses for the House that preserves its history, creates jobs and stimulates the local economy. Inspired? 🖉 Feel free to add you ideas for Bostwick House to the comments below! Where Am I Wednesday – Disco Turtle Style! 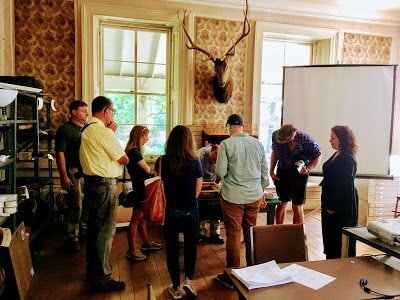 Love Bostwick House — great way for it's preservation to proceed — and local students to "get their hands dirty" with the realities of history.